The king had appointed people to sing before the Lord and before the Army of Judah. The Scriptures say the praises of God’s people set up ambushes before the enemy to destroy the sons of Ammon, Moab, and Mount Sier. The king realized how the Lord supports His people during times of calamity and peril. If we stand before the Lord and cry out to Him in our distress, He will hear us and save us. The king said “We have no power against this great army that comes against us. We do not know what to do, but our eyes are upon You!” The Lord gave a word to the young priest to speak to the people and to the king. The word of the Lord said “You will not need to fight in this battle,” God’s message through Jahaziel continued saying “Position yourselves, stand still, and see the salvation of the Lord, who is with you!” As a result of these words, the king and all the people bowed down to the ground in worship. The priests continued to raise their voices in praise to the Lord. The next morning as the troops made preparations for battle, King Jehoshaphat encouraged them. “Believe in the Lord your God, and so shall you be established. Have faith in His prophets, and so shall you have good success.” When the king decided to have the singers lead the troops in battle, this demonstrated their faith being put into action as they believed the Lord God of Israel would fight for them. King Jehoshaphat instructed the singers as they took their position. “Give thanks to the Lord, for His mercy endures forever.” They were thanking the Lord God Almighty in advance for the victory He had promised the day before. The Scriptures say the Lord “set ambushes against the people of Ammon, Moab, and Mount Seir, who had come against Judah; and they were defeated.” The Scriptures do not specify what those “ambushes” were, but we are told the men of those three invading kingdoms began to fight among themselves. First the men of Ammon and Moab rose up against those of Seir, and when they had destroyed them, the two armies destroyed each other. When the army of Judah arrived at a place overlooking the battlefield, they saw only dead bodies on the ground. No one had escaped. We are then told Jehoshaphat and his men gathered so many valuables from the bodies that it took them three days to collect them all. On the fourth day they assembled in the valley and called the valley of Beracah, which means “the Valley of blessing,” and there they blessed God. Then they returned home with joy, for the Lord had triumphed over their enemies. This is the fulfillment of the psalm which states, א לְדָוִד | אוֹדְךָ בְכָל-לִבִּי נֶגֶד אֱלֹהִים אֲזַמְּרֶךָּ: ב אֶשְׁתַּחֲוֶה אֶל-הֵיכַל קָדְשְׁךָ וְאוֹדֶה אֶת-שְׁמֶךָ עַל-חַסְדְּךָ וְעַל-אֲמִתֶּךָ כִּי-הִגְדַּלְתָּ עַל-כָּל-שִׁמְךָ אִמְרָתֶךָ: 138:1 I will give You thanks with all my heart; I will sing praises to You before the gods. 138:2 I will bow down toward Your holy temple And give thanks to Your name for Your lovingkindness and Your truth; For You have magnified Your word according to all Your name. (NASB) We praise the Lord for all that He has done in keeping His words and His promises. As a result of these things, the fear of God came on all the neighboring kingdoms when they heard how He had interceded for Judah, and the kingdom of Judah was quiet because the Lord God had given him rest. This stands as an everlasting testimony to the power of faith and faithfulness, prayer and praise. This same power of God is available to us today. Whenever we face a problem that is too big for us, if we pray in faith and seek Him and His ways, believing upon the promises God has given us in His Word, we can rest assured the Lord is fighting on our behalf. The act of praise and giving praise is putting faith into action. The reason being, we praise His holy name because we believe He answers prayer, even before we see our prayers answered. The rabbis focus on the words of the mouth of God being written in the plural form as opposed to the singular. The kings giving praise to the Lord due to all of His words and not just a few words (commandments, or NT only) while discarding the rest. This is connected to having no other gods before the Lord God Almighty in heaven. The rabbis say the Lord teaches us this for His own honor. The reason being, as His people, His children, we are to bear His testimonies for His glory. This is paralleled to “All the kings of the earth shall give You thanks, O Lord, for they have heard the words of Your mouth” (Tehillim / Psalms 138:4) and one honoring your father and mother (Shemot / Exodus 20:11). Our words and our actions should demonstrate honor for our parents, as the Lord says if we do so we will live long in the land. In addition, references to Tehillim / Psalms 119:160 “The beginning of Your word is truth…” the Lord’s word is truth, and so should ours be if we are modeling our lives after the Lord God in heaven. The extent of honoring our parents is paralleled to honoring the Lord God in heaven. A parable is given of a gentile who had the opportunity to make a large sum of money but out of honor for his father, he did not wake him to get the key to the safe and so he honored his father being a gentile. The idea is if a gentile is doing this, how much more should we be living in the same way? The psalm concludes saying, ו כִּי-רָם יְהֹוָה וְשָׁפָל יִרְאֶה וְגָבֹהַּ מִמֶּרְחָק יְיֵדָע: ז אִם-אֵלֵךְ | בְּקֶרֶב צָרָה תְּחַיֵּנִי עַל אַף אֹיְבַי תִּשְׁלַח יָדֶךָ וְתוֹשִׁיעֵנִי יְמִינֶךָ: ח יְהֹוָה יִגְמֹר בַּעֲדִי יְהֹוָה חַסְדְּךָ לְעוֹלָם מַעֲשֵֹי יָדֶיךָ אַל-תֶּרֶף: 138:6 For though the Lord is exalted, Yet He regards the lowly, But the haughty He knows from afar. 138:7 Though I walk in the midst of trouble, You will revive me; You will stretch forth Your hand against the wrath of my enemies, And Your right hand will save me. 138:8 The Lord will accomplish what concerns me; Your lovingkindness, O Lord, is everlasting; Do not forsake the works of Your hands. (NASB) The Psalmist is saying the Lord takes care of those who are in need, those whom the Psalmist calls “the lowly.” On the other hand, the proud we are told the Lord knows from afar, suggesting that the lowly seek Him in prayer daily, while the proud do not. David believes the hand of the Lord (His right hand) will raise him up and save him from his adversaries. The Psalmist concludes asking the Lord to not forsake the work of His hands within the context of the Lord using him for His purposes. This suggests the Lord has had a hand working in David’s life. The comments about the Lord accomplishing what concerns him parallels what we read in the book of Isaiah. And your soul shall live. That is, your soul shall live for ever after the death of the body, or you will receive new life through Messiah, when you will return to the Divine Law. An everlasting covenant, that will never expire. The sure mercy of David, that is, like the covenant which I made with David and the kindness which I showed to him, promising him my mercy will I keep for him for evermore, etc. (Ps. 89:29). It is also possible, that by David in this verse Messiah is meant, who will be of the family of David; as the prophet is sometimes called Israel for the same reason; and the meaning of הנאמנים חסדי דוד is in that case: for the kindness of Messiah is sure. This explanation is supported by the next verse. Ibn Ezra believes in the afterlife saying the soul will live forever after the death of the body. He also states that we will receive “new life through the Messiah” when one returns to the Torah. Note how the Torah and the Messiah are connected. The commentary states “for the kindness of Messiah is sure. This explanation is supported by the next verse,” 55:4 ‘Behold, I have made him a witness to the peoples, A leader and commander for the peoples. (NASB) This parallels the NT descriptions of the Messiah Yeshua. We do not have to doubt who Yeshua is as the Messiah of God and His purpose to lead us in righteousness, holiness, and truth, and by faith in his life and his merits we have eternal life. If we truly believe this, we will apply these truths and Yeshua’s way of life to ours, for the glory of God. The Rabbinic Commentary (Midrash) on Tehillim / Psalms 138 has 2 parts. Reading through the Midrash we will be looking at Part 1 and 2. Let’s begin by outlining Midrash Tehillim Chapter 138, Part 1 and 2. The משל (mashal) “the parable,” goes on to explain the פתיחתא (Petihta), the rabbis discuss what do you do when the grass withers and the flower fades? The נמשל (Nimshal) “expansion on the parable” expands upon the משל (mashal), the rabbis say this refers to the wicked nations, the Lord will cause our enemies to fade and wither. The משל (mashal) “the parable,” goes on to explain the פתיחתא (Petihta), the rabbis speak of the enemies of Israel waning away (withering). The נמשל (Nimshal) “expansion on the parable” expands upon the משל (mashal), the rabbis say the name of the Lord will be glorified because He saves His people, His word comes true! 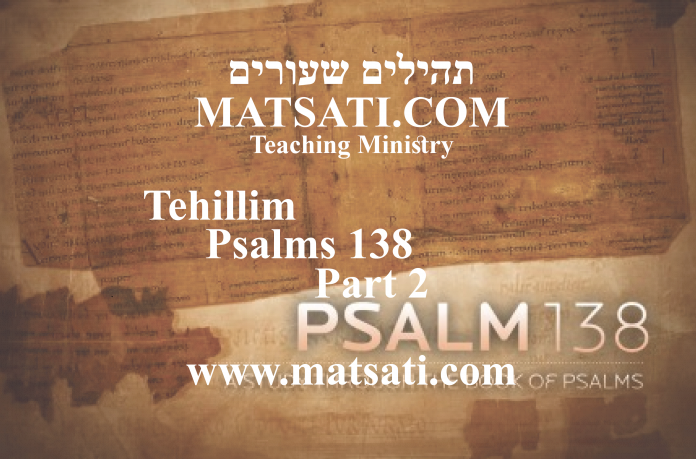 Midrash Tehillim 138 Part 1 opens with the Dibur Hamathil (דיבור המתחיל) saying, “A Psalm of David. I will give You thanks with my whole heart (Tehillim / Psalms 138:1).” The פתיחתא (Petihta) the homiletic introduction to the midrash states, “Isaiah said, The grass withers, the flower fades (Isaiah 40:7). When these things occur, what should you do?” The midrash begins with grass withering, flowers fading, and man praising the Lord giving thanks for how He has worked in our lives. This sounds like a description of growing old gracefully. In Tehillim / Psalms 71, the psalm is permeated with a deep personal understanding and practical knowledge of the Lord God Almighty. The author of the psalm wrote that he had been taught of God even from his youth (71:17) which states that he had godly parents. The man knew God as his refuge (71:1and 7 “strong refuge”), and as his righteous Savior (71:2). The psalmist mentions the righteousness of God frequently in Tehillim / Psalms 71 (71:2, 15, 16, 19, 24), which illustrates His faithfulness to His own people in keeping His promises. David calls God his rock of habitation, his rock and fortress (71:3), his hope and confidence (71:5). The psalmist speaks of God’s mighty deeds (71:16), His strength and power (71:18), and the great things He has done (71:19). He believes it was the Lord who brought him into trouble and Lord who delivered and restored him (71:20). The God of Israel was his source of comfort in this trial (71:21). The Lord God had redeemed his soul (71:23). He proclaimed that his mouth was filled with God’s praise and glory and righteousness all day long (71:8, 22, 23, 24). As this man grew older, he knew God. Based upon his writings, he had known the Lord for many years and had proved God’s faithfulness in a number of previous difficult situations. Because he could see the Lord working in his life, his trusting in the Lord was not a matter of, “God, if You exist, whoever You are, if You’re out there I need your help!” David was not taking a blind leap of faith because he knew his God in a personal, practical, and proven way. The practical aspect to our faith is found in the Torah. א לדוד אודך בכל לבי וגו׳. אמר ישעיה יבש חציר נבל ציץ (ישעיה מ ז), ואתם מה לכם לעשות, על הר גבוה עלי לך מבשרת ציון (שם שם ישעיהו מ׳ ט), אמרו ישראל מתייראין אנו מפני שונאים, אמר הקב״ה השונאים חציר היו, כלומר כל זמן שהיו קיימים הייתם מתייראים מהם, עכשיו שאבדו, כי רוח ה׳ נשבה בו (שם שם ישעיהו מ׳ ז), ממי אתם מתייראים, הרימי בכח קולך וגו׳ הרימי אל תיראי וגו׳ (שם שם ישעיהו מ׳ ט), אמרו ישראל אימתי אנו מקלסין, כשישלם גמול לרשעים, שנאמר כאשר עשית יעשה לך גמולך ישוב בראשך (עובדיה א טו), מה היה הגמול שנפץ את עוללי ישראל אל הסלע, שנאמר אשרי שיאחז ונפץ את עולליך, אל הסלע (תהלים קלז ט ), אותה השעה מקלסין ישראל בכל לבם להקב״ה, שנאמר אודך בכל לבי, מכאן אתה למד שכל זמן שהרשעים בעולם הם משעבדים את ישראל, ודוחקים אותם, ואינם פנויים לקלס בכל לבם, ואם אובדים אותה שעה אודך בכל לבי וגו׳. נגד אלהים אזמרך. נגד סנהדרין, שנאמר אלהים לא תקלל (שמות כב כז), ונגד הנביאים שנקראו אלהים, שנאמר ומשה איש האלהים (דה״א דברי הימים א׳ כג יד), ויבא איש אלהים אל עלי (ש״א שמואל א׳ ב כז), ואף במיתתן נקראו אלהים, שכן אתה מוצא בשמואל (ראיתי) אלהים [ראיתי] עולים מן הארץ (שם שמואל א׳ כח יג), לכך נאמר נגד אלהים אזמרך, נגד הצרות הבאות עלינו אנו מזמרין לך. 1. A Psalm of David. I will give You thanks with my whole heart (Tehillim / Psalms 138:1). Isaiah said, The grass withers, the flower fades (Isaiah 40:7). When these things occur, what should you do? Then, O you that tell good tidings to Zion, get you up into the high mountain (Isaiah 40:9). When the children of Israel say, We are afraid of them that hate us, the Holy One blessed be He, will answer, They that hate you are become like grass that is, as long as they were standing, you had reason to fear them, but now that they had withered the breath of the Lord blows upon it (Isaiah 40:7) what have you to fear? Therefore, O you that tell good tidings to Jerusalem, lift up your voice with strength; lift it up, be not afraid (Isaiah 40:9). The children of Israel say, when will we offer praise? When God requites the wicked for their dealing, as it is said, As you have done, it will be done unto you; your dealing will return upon your own head (Obadiah 1:15). What was Edom’s dealing? Edom dashed the little ones of Israel against the rock. For this reason it is said, O Edom, Happy will he be that takes and dashes your little ones against the rock (Tehillim / Psalms 137:9). In that hour the children of Israel will give thanks with all their heart to the Holy One blessed be He, as it is said I will give You thanks with my whole heart. Thus you learn that as long as the wicked are in the world, they enslave the children of Israel and oppress them, so that the children of Israel cannot take breath to thank God with all their heart. But when the wicked wither away, then I will give You thanks with my whole heart. Before the gods will I sing praise unto You (Tehillim / Psalms 138:1) that is, before the judges of the Sanhedrin, concerning whom it is said, You will not revile the gods, nor curse the ruler of your people (Shemot / Exodus 22:27). Or, the phrase before the gods may refer to the Prophets who are called gods, as it is said Moshe, the man, the god (1 Chronicles 23:14), and as it is also said There came a man, a god, unto Eli (1 Samuel 2:27). Even after death, the Prophets are called gods, as you find it said of Samuel, I saw gods ascending our of the earth (1 Samuel 28:13). Accordingly, Before the gods will I sing praises unto You means that even under the weight of the judgments upon us, we will sing praise unto You. When these things occur, what should you do? Then, O you that tell good tidings to Zion, get you up into the high mountain (Isaiah 40:9). When the children of Israel say, We are afraid of them that hate us, the Holy One blessed be He, will answer, They that hate you are become like grass that is, as long as they were standing, you had reason to fear them, but now that they had withered the breath of the Lord blows upon it (Isaiah 40:7) what have you to fear? Therefore, O you that tell good tidings to Jerusalem, lift up your voice with strength; lift it up, be not afraid (Isaiah 40:9). The children of Israel say, when will we offer praise? When God requites the wicked for their dealing, as it is said, As you have done, it will be done unto you; your dealing will return upon your own head (Obadiah 1:15). What was Edom’s dealing? Edom dashed the little ones of Israel against the rock. For this reason it is said, O Edom, Happy will he be that takes and dashes your little ones against the rock (Tehillim / Psalms 137:9). The Midrash has the rabbis calling upon the people to sing praises to the Lord in the midst of her enemies. The Edomites are said to have dashed the little children upon the rocks in Israel. The sins of the wicked are said to return unto them, and the same will happen to them. This draws in the concept of doing what is right as Obadiah states, “As you have done, it will be done unto you; your dealing will return upon your own head (Obadiah 1:15).” To live righteously, its fruit, its reward is a life that is filled with joy and peace, and within the context of what we do returning upon our head. This relates to living in righteousness, justice, and truth, and this is the desirable thing. This also draws in the context of getting old (grass withers and flower fades) and doing so for the glory of God. This means growing old while bearing His testimonies in a way that brings glory to His name! This means living and dying in a way that shows others that the Lord God of Israel is the all-satisfying Treasure that He is. This suggests that we not live in ways that makes this world look like our treasure instead. Growing old as Isaiah describes the grass withering and the flower fading means we take whatever strength that we have, and the resources at our disposal to treasure the Lord God Almighty, our Father in heaven, and His Messiah Yeshua, in the joy of serving others. This is what Paul meant when he wrote to Timothy in 2 Timothy 4:7-8, “I have fought the good fight, I have finished the race, I have kept the faith. Henceforth there is laid up for me the crown of righteousness, which the Lord, the righteous judge, will award to me on that Day, and not only to me but also to all who have loved his appearing.” Paul wrote of the reward of the final righteousness that comes to those who love the Lord’s appearing, who are treasuring Him, and who continue to serve Him with what they have been given. The treasuring of the Lord God Almighty, His Words, and His Messiah involves the fight that is fought, the finished-race, and the kept-faith (faithfulness). One example of this is found in Christian history, Polycarp the Bishop of Smyrna in Asia Minor. Polycarp was the Bishop of Smyrna in Asian Minor. He lived from about AD 70 to 155. He is famous for his martyrdom which is recounted in The Martyrdom of Polycarp and found in Henry Bettenson’s Documents of the Christian Church (Oxford, 1967, pp. 9-12). Tensions had risen between the Christians and those who venerated Caesar. The Christians were called atheists because they refused to worship any of the Roman gods and had no images or shrines of their own. At one point, a mob cried out, “Away with the atheists; let search be made of Polycarp.” At a cottage outside the city, he remained in prayer and did not flee. He had a vision of a burning pillow and said to his companion, “I must needs be burned alive.” The authorities sought him, and he was betrayed to them by one of his servants under torture. He came down from an upper room and talked with his accusers. “All that were present marveled at his age and constancy, and that there was so much ado about the arrest of such an old man” (p. 9). He asked for permission to pray before being taken away. They allowed it and “being so filled with the grace of God that for two hours he could not hold his peace” (p. 10). In the town, the sheriff met him and took him into his carriage and tried to persuade him to deny Christ, “Now what harm is there in saying ‘Lord Caesar,’ and in offering incense . . . and thus saving thyself?” He answered, “I do not intend to do what you advise.” Angered, they hastened him to the stadium where there was a great tumult. “How Can I Blaspheme My King Who Saved Me?” The proconsul tried again to persuade him to save himself, “Have respect to thine age . . . Swear by the genius of Caesar . . . Repent . . . Say, ‘Away with the atheists! [that is, Christians].” Polycarp turned to the “mob of lawless heathen in the stadium, and he waved his hand at them, and looking up to heaven he groaned and said, ‘Away with the atheists.’” Again the proconsul said, “Swear, and I will release thee; curse the Christ.” To this Polycarp gave his most famous response, “Eighty and six years have I served him, and he hath done me no wrong; how then can I blaspheme my king who saved me?” The proconsul said again, “Swear by the genius of Caesar.” And Polycarp answered, “If thou dost vainly imagine that I would swear by the genius of Caesar, as thou sayest, pretending not to know what I am, hear plainly that I am a Christian.” The proconsul replied, “I have wild beasts; if thou repent not, I will throw thee to them.” To which Polycarp replied, “Send for them. For repentance from better to worse is not a change permitted to us; but to change from cruelty to righteousness is a noble thing” (p. 11). The proconsul said, “If thou doest despise the wild beasts I will make thee to be consumed by fire, if thou repent not.” Polycarp answered, “Thou threatenest the fire that burns for an hour and in a little while is quenched; for thou knowest not of the fire of the judgment to come, and the fire of the eternal punishment, reserved for the ungodly. But why delayest thou? Bring what thou wilt.” The proconsul sent word that it should be proclaimed aloud to the crowd three times, “Polycarp hath confessed himself to be a Christian.” After the crowd found out that there were no beasts available for the task, they cried out for him to be burned alive. The wood was gathered, and as they were about to nail his hands to the timber he said, “Let me be as I am. He that granted me to endure the fire will grant me also to remain at the pyre unmoved, without being secured with nails.” The fire did not consume him, but an executioner drove a dagger into his body. “And all the multitude marveled at the great difference between the unbelievers and the elect.” (p. 12). Polycarp ended well, he maintained the faith, he went to his death believing words are synonymous to disobedience, to acknowledge Caesar as Lord would be to blaspheme Yeshua and the Father in heaven. This is what Paul meant of the reward of the final righteousness that comes to those who love the Lord’s appearing, who are treasuring Him, and who continue to serve Him with what they have been given. The treasuring of the Lord God Almighty, His Words, and His Messiah include the fight that is fought, the finished-race, and the kept-faith (faithfulness). Midrash Tehillim 138 Part 1 concludes saying, “Even after death, the Prophets are called gods, as you find it said of Samuel, I saw gods ascending out of the earth (1 Samuel 28:13). Accordingly, Before the gods will I sing praises unto You means that even under the weight of the judgments upon us, we will sing praise unto You.” This is the very thing Polycarp did according to the record of his death. He stood still while the fire burned and the fire did not kill him, so the executioner drove a dagger into his body and he died. Praises to the Lord go by reason that we are counted worthy to suffer for the Messiah. Acts 5:41 The apostles left the Sanhedrin, rejoicing because they had been counted worthy of suffering disgrace for the Name. (NIV) When you suffer for the Name of Yeshua, suffering disgrace, pain, or hardship, do you praise the Lord being counted worthy to suffer for His Name? ב אשתחוה אל היכל קדשך ואודה את שמך. וכה״א ביום ההוא יאמר לירושלים אל תיראי וגו׳ (צפניה ג טז), כך כשיאבדו רשעים מן העולם, ישראל מקלסין להקב״ה, כשיבנה היכל ובית מקדשו אותה שעה אשתחוה אל היכל קדשך, למה כי הגדלת על כל שמך אמרתך, אמרו ישראל להקב״ה הגדלת על כל מה שאמרת לנו על ידי הנביאים, ומה אמרת, והיה אחרי כן אשפוך את רוחי וגו׳ (יואל ג א), והיה ביום ההוא יטפו ההרים עסיס (שם יואל ד יח), וכה״א אל תיראי אדמה וגו׳ (שם יואל ב כא), למה, כי הגדיל ה׳ לעשות (שם שם יואל ב׳) , וכתיב אז ימלא שחוק פינו וגו׳ הגדיל ה׳ לעשות עם אלה וגו׳ (תהלים קכו ב). 2. I will bow down toward Your Holy Temple, and give thanks unto Your name (Tehillim / Psalms 138:2). As Scripture says, The Lord has taken away your judgments, He has cast out your enemy; the King of Israel, even the Lord, is in the midst of you; you will not fear evil any more. In that day it will be said to Jerusalem, Fear you not; O Zion, let not your hands be slack (Zephaniah 3:15-16). So after the wicked have withered away from the earth, the children of Israel will praise the Holy One blessed be He. And when the Temple and its holy shrine are rebuilt, in that hour I will bow down toward Your mercy and for Your truth. Wherefore? Because You have magnified Your name and Your word above all things (Tehillim / Psalms 138:2). That is, the children of Israel will say to the Holy One blessed be He, You have made Your name and Your word greater than all the things which You did promise us through the Prophets. And what did You promise? Not merely And it will come to pass afterward, that I will pour out My spirit upon all flesh (Joel 3:1); but also, it will come to pass in that day, that the mountains will drop down sweet wine (Joel 4:18). Hence, Scripture says, Fear not, O land, be glad and rejoice (Joel 2:21). Wherefore rejoice? Because The Lord will do great things. Hence, it is also written, Then was our mouth filled with laughter, and our tongue with singing; then said they among the nations, The Lord has magnified to do with them (Tehillim / Psalms 126:2). The term messenger draws in the context of Moshe having doubts as this is related to being a reminder of Aaron his brother and the failures of the people again and again. Moshe was apprehensive about the Lord sending a fellow laborer, this messenger. Moshe made the petition , “Now, therefore, I pray Thee, if I have found favor in Thy sight, let me know Thy ways, that I may know Thee, so that I may find favor in Thy sight. Consider too, that this nation is Thy people” (Shemot / Exodus 33:13). Moshe asked that the Lord Himself go with him and Israel because without the Lord guiding, protecting, and sustaining them, all of Israel will be destroyed. All of these things are related to what the Midrash states “The Lord has taken away your judgments, He has cast out your enemy; the King of Israel, even the Lord, is in the midst of you; you will not fear evil any more. In that day it will be said to Jerusalem, Fear you not; O Zion, let not your hands be slack (Zephaniah 3:15-16).” We do not have to fear with the Lord dwelling in our midst. However, if we are living in unrepentant sin, there is much to worry about! The Midrash goes on to speak of the Lord keeping His promises found in the rebuilding of the Temple. Midrash Tehillim 138 Part 2 concludes saying, “You have magnified Your name and Your word above all things (Tehillim / Psalms 138:2). That is, the children of Israel will say to the Holy One blessed be He, You have made Your name and Your word greater than all the things which You did promise us through the Prophets. And what did You promise? Not merely And it will come to pass afterward, that I will pour out My spirit upon all flesh (Joel 3:1); but also, it will come to pass in that day, that the mountains will drop down sweet wine (Joel 4:18). Hence, Scripture says, Fear not, O land, be glad and rejoice (Joel 2:21). Wherefore rejoice? Because The Lord will do great things. Hence, it is also written, Then was our mouth filled with laughter, and our tongue with singing; then said they among the nations, The Lord has magnified to do with them (Tehillim / Psalms 126:2).” Note how the Midrash emphasizes the Lord placing His name and His word about all things. Within the Psalmists words, the rabbis claim are a prophetic message “You have magnified Your name and Your word above all things (Tehillim / Psalms 138:2)” leads to the prophet Joel. וַאֲכַלְתֶּ֤ם אָכוֹל֙ וְשָׂב֔וֹעַ וְהִלַּלְתֶּ֗ם אֶת־שֵׁ֤ם יְהוָה֙ אֱלֹ֣הֵיכֶ֔ם אֲשֶׁר־עָשָׂ֥ה עִמָּכֶ֖ם לְהַפְלִ֑יא וְלֹא־יֵבֹ֥שׁוּ עַמִּ֖י לְעוֹלָֽם׃ 2:26 And you shall eat your fill And praise the name of the LORD your God Who dealt so wondrously with you— My people shall be shamed no more. וִידַעְתֶּ֗ם כִּ֣י בְקֶ֤רֶב יִשְׂרָאֵל֙ אָ֔נִי וַאֲנִ֛י יְהוָ֥ה אֱלֹהֵיכֶ֖ם וְאֵ֣ין ע֑וֹד וְלֹא־יֵבֹ֥שׁוּ עַמִּ֖י לְעוֹלָֽם׃ (ס) 2:27 And you shall know That I am in the midst of Israel: That I the LORD am your God And there is no other. And My people shall be shamed no more.” וְהָיָ֣ה אַֽחֲרֵי־כֵ֗ן אֶשְׁפּ֤וֹךְ אֶת־רוּחִי֙ עַל־כָּל־בָּשָׂ֔ר וְנִבְּא֖וּ בְּנֵיכֶ֣ם וּבְנֽוֹתֵיכֶ֑ם זִקְנֵיכֶם֙ חֲלֹמ֣וֹת יַחֲלֹמ֔וּן בַּח֣וּרֵיכֶ֔ם חֶזְיֹנ֖וֹת יִרְאֽוּ׃ 3:1 After that, I will pour out My spirit on all flesh; Your sons and daughters shall prophesy; Your old men shall dream dreams, And your young men shall see visions. וְגַ֥ם עַל־הָֽעֲבָדִ֖ים וְעַל־הַשְּׁפָח֑וֹת בַּיָּמִ֣ים הָהֵ֔מָּה אֶשְׁפּ֖וֹךְ אֶת־רוּחִֽי׃ 3:2 I will even pour out My spirit Upon male and female slaves in those days. Note how in the prophet Joel, he states that the Lord will also pour out His Spirit upon the male and female slaves. (Joel 3:2) This is significant if we consider the slaves, from a Torah perspective, the Lord God Almighty set Israel free from slavery. Who are these slaves? If we remember what is written in the Torah and in the book of Joshua, those nations that remained in the Land, Israel put them to work as slaves. So what He may be referring to here is the Lord will also pour out His Spirit on the nations in the last days. This will then cause “our mouth filled with laughter, and our tongue with singing; then said they among the nations, The Lord has magnified to do with them (Tehillim / Psalms 126:2).” The nations will glorify the Lord God of Israel. To glorify God is related to speaking of his wonders and living as if we believe it. glorifying God involves honoring His name, praising His name, and worshiping the Lord, to acknowledge His greatness and giving him honor, particularly in the way we treat others. Stephen, in his final comments before he was stoned to death for his faith, retold the story of God’s dealings with Israel from the time Abraham left his country in obedience to God’s command, all the way to the coming of the Messiah, the “Righteous One of God,” whom the religious leaders had betrayed and murdered. When we speak of God’s work in our lives, how He saved us from sin, and to overcome sin in our lives by the marvelous works He does in our hearts and minds every day, we glorify Him before others. The way we live our lives, if we do so according to His Word, we bear His testimonies before all the world. Even though others don’t always want to hear our glorifying God, the Lord is pleased when we obey His commands and speak of His mercies each day. The crowd who heard Stephen hated what he said, covering their ears and rushing at him to stone him. “But Stephen, full of the Holy Spirit, looked up to heaven and saw the glory of God, and Jesus standing at the right hand of God” (Acts 7:55). To glorify God is to proclaim His attributes, His holiness, faithfulness, mercy, grace, love, majesty, sovereignty, power, and omniscience, and telling others about the awesome nature of the salvation only He can offer. Let’s Pray! Parashat Balak, Are you persistently walking in your own way?